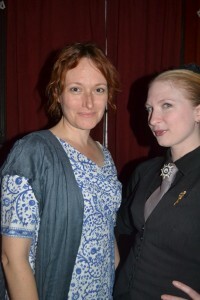 It was a night of myriad voices, living and dead, but fully present and well acted by Mary Robinette Kowal and Leanna Renee Hieber. Mary read from the forthcoming final book of her Glamourist Histories, then teased us a bit with ghostly excerpts from a completely new novel. Leanna read from her forthcoming novel The Eterna Files, Book One. Ellen’s photos of the night can be seen here.